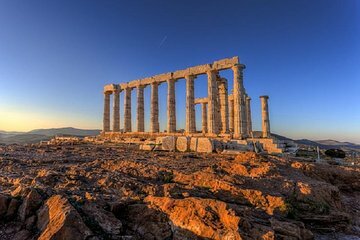 Soak in the beauty of Cape Sounion and the Attica Peninsula on an 8-hour afternoon and evening tour from Athens. With an expert guide, travel south along the shores of the Saronic Gulf. Stop to swim at a sandy beach and visit Cape Sounion, home to the ancient, clifftop Temple of Poseidon. Learn the temple’s history and legends, and admire the views over the Aegean Sea as the sun sets. Lastly, visit a taverna to enjoy a complimentary wine, raki or ouzo paired with Greek ‘meze,’ small platters of appetizers.